Does your son or daughter have a classroom full of sweet friends? Maybe your church is busting at the seems with small friends who need some love in an envelope. Perhaps there are adults in your life who would love a picture of your sweet family. 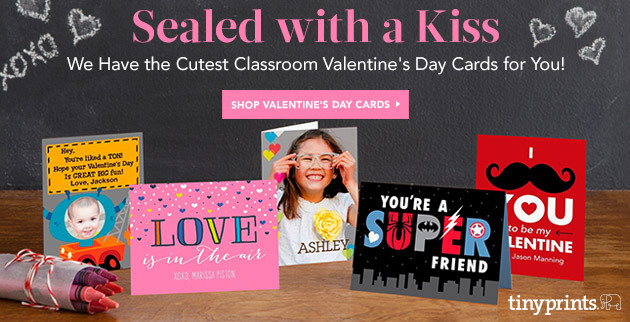 Regardless of who you’re wanting to love on this Valentine’s Day, Tiny Prints has adorable cards that can be customized with your child’s pictures and your own text in whatever fonts you choose. Tiny Prints also has great customized photo gifts and its sister company, Treat, has some awesome personalized greeting cards. If you order by Jan. 30 and use the promo code 20JANSW you can save 20% on your entire order! Disclaimer: Compensated affiliate links used. But, hey, I really do like ordering from Tiny Prints. Want more? Subscribe to get “Insights” in your inbox. Or follow me on Twitter.